Join us on a 75 mile fun bike ride from our Outpost Brewery & Tap Room through the Virginia heartland on paved roads including the Blue Ridge Parkway to our Basecamp Brewpub & Meadows where we'll have our cold, sessionable Daypack beers and a post ride party waiting for you at the finish. Brewery 2 Brewery is a road ride on county and state maintained roads. The ride is point to point with post-ride people shuttle options. View the route and cue sheet here. Ride entry includes a $10 Devils Backbone gift card (valid for food, drink and/or merchandise purchase at Devils Backbone), Devils Backbone water bottle & DB swag, plus an optional post-ride shuttle. For riders who are not able to arrange a shuttle with fellow riders, we are offering a shuttle option. The Devils Backbone shuttle is FREE and will be for riders only (no bikes). Shuttle will leave Basecamp Brewpub & Meadows at 7PM on 9/10 and carry riders (no bikes) back to Outpost Brewery & Tap Room in Lexington, VA. A bike corral will be set up at Basecamp to keep bikes safe during this time. You must egister for the ride in advance! We will not take additional riders on the day of the event. 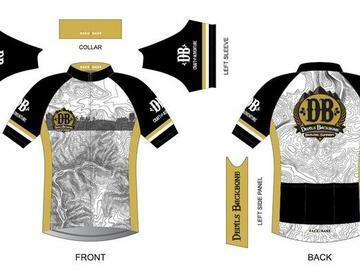 Jerseys are available for purchase for men and women (photo below), and they are club cut. The design features the DB logo, as well as detailed topography maps of Lexington and Roseland! Proceeds from this ride will benefit the National Ovarian Cancer Coalition.